Foosball is one of those simple games that doesn’t need fixing. It’s already the perfect way to waste four years of college. 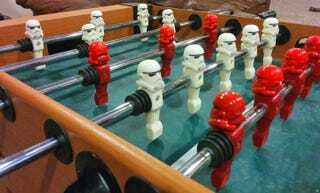 But it turns out there is actually a way to make table soccer even more enjoyable: by turning all of the players into opposing squadrons of stormtroopers. If you’ve got access to a 3D printer this is actually an easy upgrade because all you need to is download this simple helmet model from Youmagine 3D, choose your plastic PLA colors to match your existing players, and start printing.